In this blog post, I’ll show you how I build an ASP.NET Core 2.0 Web Application using multi-stage build and make my application more secure, light and efficient. Multi-stage build allows me to use two different Container Images to build .NET applications by using one Container for building the code using tools (SDK) and another Container just to run the code (runtime). In my case, I’ll use one Container for the build which has the .NET Core 2.0 SDK tools loaded and another Container to just run the app with runtime tools Installed only. Both Images runs on Windows Nano Server 2016, however, the size of the SDK Image Is almost double the size of the runtime Image. The first reason Is size, the SDK Image comes with many tools and options needed for building, debugging, restoring, etc applications that are not necessary for running the app. Efficiency, In large microservers environment where each service runs on a container the build process needs to efficient, light and small. Security, Smaller Images need less downtime, patching and updates which make them more secure. 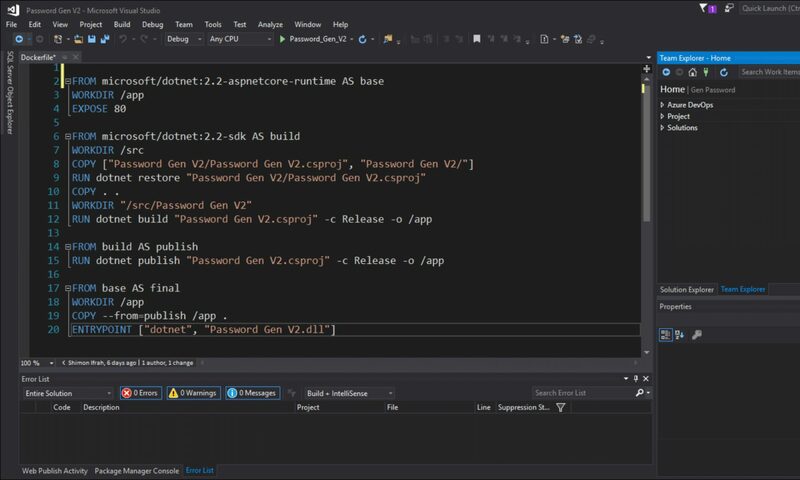 In the example below, I’ll create an ASP.NET Core 2.0 Razor web application on the full dotnet container Image, once completed I’ll spin another Container with the ASP.NET Core 2.0 Image which Is half the size of the dotnet Image to just run the code. All the Web App data will be saved to a Volume on the Container Host. To get started, I’ll download the full Dotnet Image with the SDK loaded. Below, you can see the two Images and their size on disk after download. The dotnet Image Is 2.6 compared to only 1.3GB for the ASP Image. Inside the Container, I’ll run the lines below that will create, build, and publish my Web App. Now, All I need to do Is to run my Web App on the ASP container Image using the code below with the same volume. Below, I have types of codes, One with port mapping and the second without, to see that it works I’ll use the second line. From Inside the container Web App mapped volume, I’ll run the code below to run the Web App.